Water treatment solutions are integral to our health and a crucial part of the modern manufacturing process. Below, we’ve taken a closer look at the processes and technology behind the two most ubiquitous forms of water treatment: drinking water and industrial water treatment. In order for water to be considered safe to drink or use in washing or food preparation, it must meet national water quality standards and World Health Organization (WHO) guidelines. To conform to these regulations, wastewater, groundwater, surface water, and other water resources must be treated before they can be funneled into the taps of local homes and businesses. The treatment process for drinking water is designed to remove bacteria, solids, algae, viruses, fungi, and mineral deposits from the water that might cause harm to the consumer. Because the stakes are so high, water quality standards are overseen by the government and demand a multistep treatment process. Pre-chlorination: This step adds chlorine to water at the beginning of treatment in order to kill any bacteria that are present and prevent further biological growth. Aeration: This step adds oxygen to water in order to neutralize (through the chemical process of oxidation) dissolved iron. Coagulation: This step adds polymers (aka coagulation aids) to water in order to chemically neutralize the contaminants present or aggregate them into larger compounds that can be easily filtered from the water. Sedimentation: This allows solid particles that are suspended in the water to come to rest (with the aid of gravity or a centrifuge device) so that they may be easily filtered from the water. Filtration: This removes any residual solids from the water by passing the substance (filtrate) through another medium (filter). Filters can be physical (like a coffee filter), mechanical (such as an industrial skimmer), or biological in nature. Many water purification devices use a slow sand filter, a type of biological filter that naturally grows on sand particles. Disinfection: This step adds antimicrobial agents to water in order to kill any remaining microorganisms that are present. This may involve adding chlorine or oxidizing agents to the water or exposing it to extreme pressures, temperatures, or ultraviolet rays. At each stage in the water purification process, water quality tests must be performed, and data must be closely monitored. Inline water quality instruments are used in treatment plants to provide continuous water quality readings. They’re also connected to dosing pumps (for chlorine, coagulation aids, and other disinfecting substances) to automatically adjust disinfectant levels based on data feedback. In addition to inline meters, water quality is also monitored manually in on-site labs with the help of benchtop and portable meters. These additional spot tests provide an extra layer of quality assurance, verifying the accuracy of inline devices and ensuring the purity of the end product. Water is used in the manufacturing industry to both refine raw materials and manufacture goods. In order for water to be fit for use in manufacturing, it must first undergo treatment to adhere to specific water quality standards. This is exceptionally important in the food and beverage industry, where water quality standards are highly regulated and overseen by the Food and Drug Administration (FDA). Throughout the manufacturing process, water is exposed to different elements and contaminants. After being used in manufacturing, it exits the process as an industrial byproduct called wastewater. Wastewater must be treated so that it can be recycled within the facility or safely released back into natural water reservoirs. By treating water on site and recycling it back into production (as opposed to transporting it offsite for treatment and disposal), companies are able to significantly reduce their water consumption and cut overhead costs. In the industrial sector, water treatment typically refers to three different processes: wastewater treatment, boiler water treatment, and cooling water treatment. 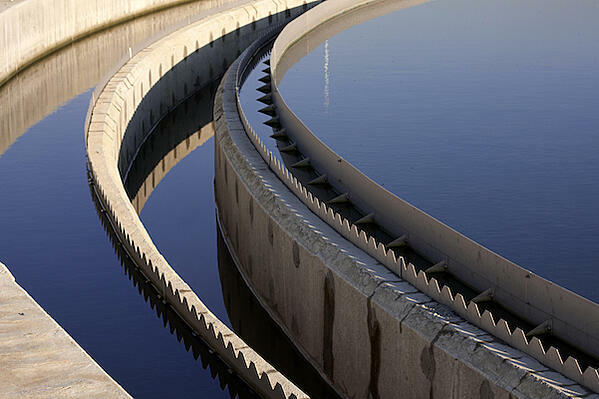 Industrial wastewater treatment varies by industry and is dictated by the materials and contaminants involved. That said, it typically involves removing dissolved solids (such as salt ions) and solid mineral deposits from the solution, separating out oils or gases that have become suspended in the water, filtering out any organic compounds and remaining toxic materials, and neutralizing acidic or alkaline elements present. Contaminant substances can be removed by adding neutralizing chemicals to the solution, by physically filtering or “skimming” the substance, and by altering its physical state (e.g., boiling water to separate out dissolved solids). Boilers are often used in manufacturing plants to heat water for sanitation, cooking, heat, or power generation. When water evaporates, it can leave residual mineral deposits on the inside of the boiler that impede steam generation and can cause machine failure. To keep boilers running up to par, industrial facilities must closely monitor the quality of the water that enters these vessels. To prevent boiler erosion, explosion, or contamination, water is treated before entering these machines to remove chemicals and impurities that might cause problems. Cooling towers are used in manufacturing facilities to transform waste heat (produced by heating and ventilation machines or manufacturing processes) and wastewater into a vapor that can be safely released into the atmosphere. Similar to boilers, cooling towers can become damaged or hazardous if residue accumulates within the tower. Because cooling water is typically warm in temperature and rich with organic compounds, it can be a breeding ground for “microbial soup” if the incoming water isn’t properly purified. In all three processes, inline water quality testing instruments are used to ensure the purity of incoming water, monitor the presence of harmful substances, and automatically trigger dosing valves or alarms in the event that an imbalance occurs. Because inline meters must be placed in sealed-off containers and exposed to extreme pressures and temperatures, it’s essential that the electrodes used are designed to function in such volatile conditions. Due to the importance of water quality testing in the manufacturing process, many industrial facilities are also equipped with on-site laboratories. These labs are used to conduct manual water quality tests (in addition to those conducted by inline meters) using benchtop and portable meters. Beyond water treatment, water quality monitoring instruments have a wide array of applications, markets, and end users. To learn more about their many applications and discover the benefits of becoming a Jenco distributor, follow the link below.